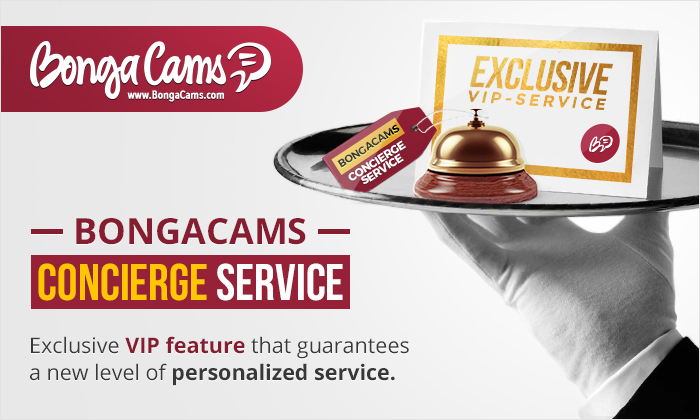 We are proud to introduce BongaCams concierge service – an exclusive VIP feature that guarantees a new level of personalized service. BongaCams concierge service is a special kind of support (can be compared to a personal secretary) that guarantees individual approach and priority service in any situation. A concierge service specialist will be extremely quick to help you solve any issue, make sure you always have exclusive offers and unprecedented opportunities right when you need them. Any issues sorted out in no time, immediate deposits, refunds, ideas and suggestions – all that is now possible to handle quicker than you could imagine was possible. Enjoy pleasant time in company of your favorite models, while our specialists will be making sure you always have everything you need when at BongaCams, no matter where you are at the time! Users with Platinum accounts and beyond can already duly appreciate all the advantages of our new VIP service. This entry was posted in BongaCams News by BongaCams. Bookmark the permalink.